(some of this material is also in other entries on Camaldoli, here and here). It really was sudden. Dangerous heat and humidity came over us, so we hastened back up to the Camaldoli convent a week or so ago. Late in the evening of the first day I asked two nuns for an electric fan for my wife. They hemmed and hawed: "—maybe tomorrow morning—we're busy with our prayers right now." So I did my best to look pathetic (imagine that!) and turned to trudge off. I started to say "Is this how you answer our Lord's call to clothe the poor, eat the hungry and fan the fanless? By sending me away?! Is this what Jesus would do? O woe to you, scribes and Pharisees..." but I didn't. I simply looked at the elder of the two and said, "Say, didn't I see you in The Bells of St. Mary's with Bing Crosby?" Her eyes went distant into long tunnels of guarded memories. "Oh, no," she said. "That was...that was Ingrid. But I get that a lot. Great song, too. Robert Emmett Dolan. Hold on a sec." Turning to young number 2, she said, "Young number 2, plug your index fingers in your ears and babble loud nonsense syllables until I tell you to stop". Then she whispered to me, "OK. Let's go find you a fan. Keep your shirt on. That's a figure of speech." She forgot to tell number 2 to stop babbling. Now that I have that out of my system it occurs to me to mention that the Camaldoli hill is of great geological interest. It is what is left of the northeastern rim of the immense Achiflegrean caldera collapse, alias the Campanian Ignimbrite explosion of 40,000 years ago, which created the Fiery Fields (Campi Flegrei —everything in the photo between the camera and the island of Ischia in the far background); that is, it created all of the western side of the entire bay of Naples. You can stand at the convent and look across the 20 km diameter (!) 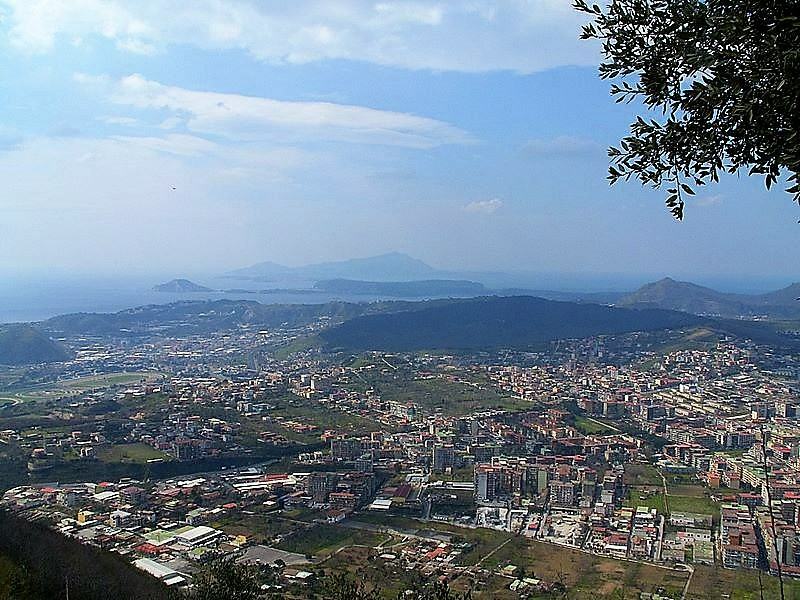 of the ancient volcano and see what is left of the southwestern rim, the hill above Baia and Cape Miseno, the strip of land in front of the island of Ischia. (This is a larger image.) That strip is the end of the Bay of Pozzuoli and the Gulf of Naples. It is where, in Greek mythology, Aeneas' conch-horn player, Misenus, would one day trade choruses with Triton, lose and pay dearly. Consider that the entire distance you are staring across was a single volcanic crater! Do the math on how big the caldera was: it's roughly a circle. From the convent (the point where the picture was taken, straight across to the other rim, Cape Miseno and the Baia ridge is about 20 km. So the radius is 10 km. The area of a circle is pi (use 3.1416) times the radius2. Big volcano, huh? It certainly was. Also, not to leave the impression that I am only out for a bit of levity at the expense of nuns and convents, there is something serious —indeed, even more serious than geology— going on in all of this. The current (since 1979) Abbess General of the Bridgettine Order is Mother Tecla (also Tekla) Famiglietti (image, with Fidel Castro). She has been called the most powerful woman in Rome and was a close friend of Pope John Paul II. In an era when Western religious orders are shrinking, the Bridgettines have 800 members and a growth rate of 4 percent, adding 30 women a year. Many —most— of them are Indian and Asian. (There is, for example, only one Italian sister at Camaldoli—elderly, born nearby.) Famiglietti presides over a network of religious homes around the world (in Cuba, the USA, various places in Europe, India, Israel, the Philippines) that double as hotels and guest houses (The headquarters is now at Piazza Farnese in Rome.) Friend Larry writes, "I loved the flap in Cuba when Mother Tekla blew off the Catholic Chain of Command, by-passed the parochial Bishop, and went right to Fidel to get the old, centrally located building in Havana. And it was not acquired using eminent domain, but perhaps by Eminence domain!" The headgear looks like the very old protective headgear that bicyclists used to wear. I said as much to my wife and she said that they looked like motorcycle helmets and wondered if the nuns, in fact, were a coven of bikers who rode out at night and terrorized the locals while we were asleep. That appealed to me... "She wore a black denim habit with motorcycle boots and a black leather jacket with an eagle on the back!" Vroooooooooom! Occasionally you see groups of young or middle-aged persons up here sitting around discussing their faith. That's fine and many of the Bridgettine guest-houses in the world advertise themselves as spiritual retreats. On the other hand, there are a lot of elderly lonely people up here, some able-bodied, some not so. That's a bit depressing; it's as if they're here hedging Pascal's Wager—that is, you never can tell, so you might as well get in one more mass before you take the Big Nap. There's a crass Italian expression for the elderly—P.C., meaning pronti per crisantemi, that is "ready for chrysanthemums." They are the traditional flower of death in Italy—you bring them to funerals. It's not a good idea to give them as a gift since you may awaken superstitions. There's probably a mythological connection, although I don't know what it is. It's like the English "pushing up daisies"—same idea, different flower, although I'm not aware that daisies are a bad omen. It's even a nice name—Daisy, as in "Daisy, Daisy, given me your answer true; I'm half crazy all for the love of you..." ["Daisy Bell (Bicycle Built for Two)", 1892, by Harry Dacre] I don't know any Italian man or woman named Chrysanthemum, but if I did I might hesitate before asking for their hand in marriage. If it's any consolation, P.C. can also mean that you're a member of the Communist Party (partito comunista), but maybe that's even worse. (Today's papers reported that a series of robberies have been committed at high schools in Naples; members of a "PC gang" are being held for questioning. I'm pretty sure they're not talking about the old-timers up here on the hill.) As it turns out, the ominous aspect of the Chrysanthemum is not nearly universal. In Japan it is a fortunate, even glorious flower. The Japanese Imperial dynasty is called the Chrysanthemum Throne. In totally unrelated news, on Day 2 I couldn't find my wallet. You know the feeling —credit cards, money. I searched the room, moved furniture— full-fledged panic. I often leave my bag untended; this is a convent, right? (The sisters don't rifle your belongings unless they're looking for smokes.) Some creep guest had probably robbed me blind while I was meditating. I went running out and apoplectically asked the first nun I saw, "Did you find a wallet!?" "Found some keys. You got your house keys?" "Of COURSE I have my keys!!" I reached into my bag. No keys. She walks to a cabinet in the kitchen, reaches in and hands me my house keys and wallet. "You left them on that table over there." 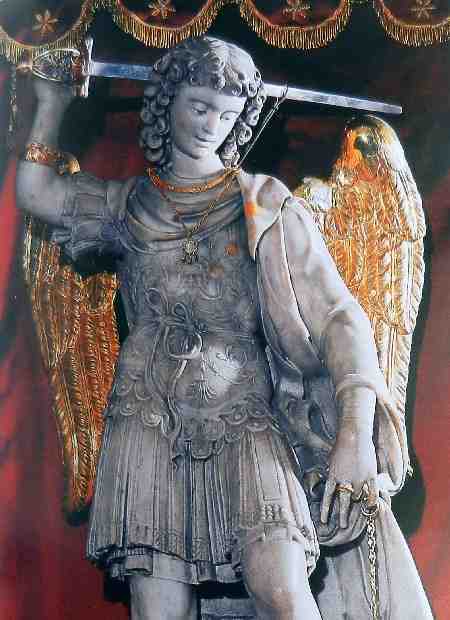 Indeed, I had been examining a painting of the Archangel Michael (image, right). He is one of the four archangels who stand around the throne of God, the angel who wrestled with Jacob, the angel who handed down the Torah to Moses. Indeed, all that, and like others of the righteous before me, I was so taken in the throes of religious ecstasy, that I had laid my earthly belongings at the disposal of whoever needed them. I am so benevolent, I make me sick. Tiny Nun said, "I bet you looked everywhere." Twinkle in her eye. "No. You're the first one I've asked." Big dark Sri Lankan smile with a boatload of teeth. Then she gives me a thumbs-up sign! I also report sadly that a sweet Polish nun, the Leader of the Pack of black denim habits and motorcycle boots, is no more! No, she has not gone to "be with Jesus" or (in more Sicilian terms) does she sleep wit' da fishes). Much worse...she was transferred... shipped out...got her marching orders...to SWEDEN! I guess that makes sense—it is the Order of Santa Brigida, a Swedish order, after all —and she was from Poland, which is up there someplace. Missed the frisfans this year. I don't know why, but the sisters have no frisbee/fans this year—or at least I have not been winged by one yet. These little sweethearts will look you right in the eye and—standing, yea, in the shadow of a statue of the Blessed Virgin—lie! They had me convinced that they were fanning themselves with a legitimate round flexible fan! "Of course, it's a fan. Look (image), you twist it in the middle and fold it to get half-sized and it slips right in your pocket. Then you pop it out, it springs back into shape and you can fan away!" Again, friend Larry tells me. "It is, indeed, a promotional cloth frisbee, not a fan. They are made in China and cost two and a half cents in lots of 5,000. And printed around the bottom are cell telephone numbers in the Philippines and Indonesia where Bridgettines operate lodging at prevailing commercial rates. Two of the locales at the bottom of the divine disc are popular beach resorts like Davao and in Bali. The Frisbee with a prayer would be a popular souvenir to play with on the resort beach served by the lodging." Alas, I so enjoyed the thought of the young nuns out in fields fanning themselves while plantin' taters for the flatlander tourists. I see now that they were just having fun. That's fair, too. So, on day three I found myself wondering if religious orders will ever start taking LGBT nuns. I always thought that stood for Lettuce, Ground Beef and Tomato. Helluva sandwich. I have so much to learn. The next day I made inquiries of the Mother Superior as to the existence of a grotto supposed to be beneath the convent and down the hill a bit. First, I used the Italian word, grotta, which in English is grotto. I am not certain why one is -a and the other -o, except they say that Grand Tourist Johann Wolfgang von Goethe thought that things as cool as large holes in the ground should at least rhyme with something German and suggested Otto. (It was, by general consensus, better than his first choice—Durchgangshöhle.) In Italian, however, grotta is usually a natural formation. The word I wanted, was really cava, a quarry. There are 700 man-made holes in the earth beneath Naples, going back to the time of the Greeks, and many of them were stone quarries for mining the yellow tufa stone to build houses and city walls. The Mother Superior said that there was a place "down there" where they once cut the stone to build the convent, church and other buildings on the premises. She wasn't sure if it was open to be seen by guests. I did a little research and found out only that the term cava Camaldoli now refers to a modern site nearby, part of the hillside gouged out to harvest the rock, leaving a large flat area with substantial sloped sides; it's ideal for very loud motorcycle nonsense. The single male cleric at the convent, a priest, told me that the quarry used to cut rock for the buildings on the premises (presumably the 1580s version by Domenico Fontana) was below the church. That does make sense and is in keeping with the way they built many buildings in those day—find a good source of rock and build above it, gradually funneling down to expand the quarry as the structure grew above it. The quarry was used as a bomb shelter in WWII but was sealed afterwards. The priest says you cannot get in to see it. Will that discourage me? Yes, probably. If you look down into the well [image, right] next to the church you can see part of the quarry. Members of a committee operating in the area told me that the refuge was restructured such as to permit visitors. It was even equipped with lighting (that you could see through a series of glass blocks set into the walkway that led to the monks' quarters. 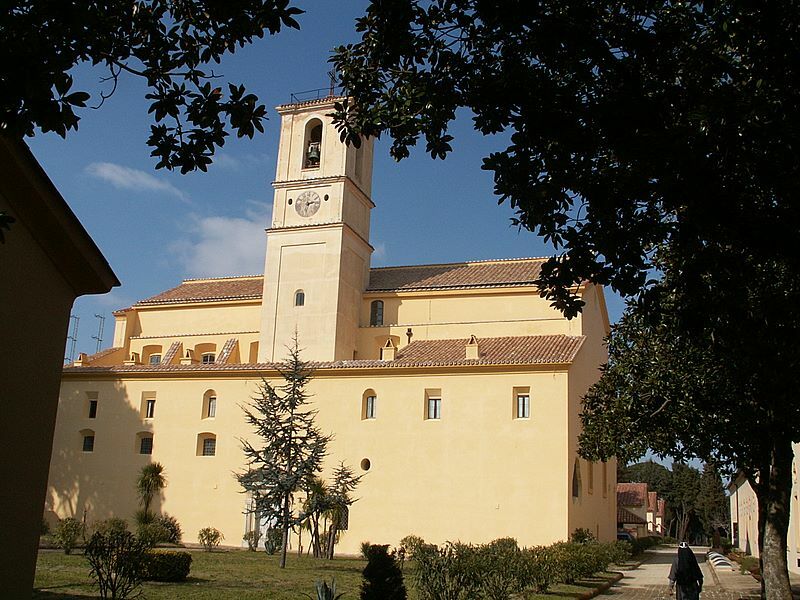 If all that (or even some of it) is true, then it must have been well before the current residents, nuns of the order of Santa Brigida, took over in the 1990s. I am trying to think if I recall semi-transparent glass blocks or panels anywhere along the walkways of the premises. Can't remember. I don't know about any trap-door, but I'd go back just for that! 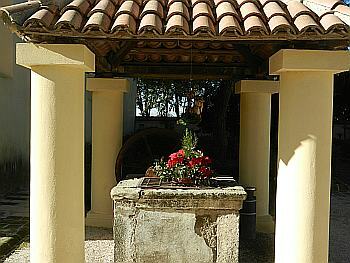 I know there's a well (image, above). You mean all I had to do was move the flowers? At least so far. Last year, at the open-air amphitheater in the woods adjacent to the premises, obnoxious music started at 11 pm. At one o'clock it stopped. Peace & Quiet. Suspicious. Some minutes later I heard a thump-thump-thump and a creaking noise. How cool, I thought, that's either a demon-possessed sprinkler system or a Tell-Tale Heart plus a coffin opening in the cellar of the convent! Golly, I bet there's a 16th-century murder mystery going on down there right now! The thumping then turned into a boom-boom-boom rhythm section, and the creaking turned into croaking and then into a tone-deaf human voice. The concert cranked up again and ended at three. We couldn't keep the windows open because of the noise, and it was too warm to sleep with the windows and shutters closed. Actually, even without the racket you couldn't have the windows and shutters open because our room was on the side of the main building that faces directly east over the city. The building is illuminated nicely and stands out at night when you view it from Naples (or the moon) because that side is flooded by light thrown up onto the façade by a row of heavy-duty JFK-runway lights that line the pathway below the building. With the window open for the cool night-time temperatures, the inside of our room was as bright as Hollywood on Oscar night. I can't believe my wife swipes those little packets of sugar that come with the coffee at the convent.